Chicken marinated in a blend of Asian-inspired ingredients – ginger, soy, cloves… Prepare additional skewers layered with your favourite veggies for a complete meal. 1. Excluding the chicken, mix all other ingredients together until the sugar is dissolved. 2. Cut chicken breast into 1-inch pieces and add to marinade. Marinate the chicken for at least 4 hours, for best results do this in the morning before heading out to work or the night before. 3. Prepare chicken for the grill by placing 4 to 5 pieces on each skewer. 4. Grill over medium heat 7 to minutes each side. Each grill is different so check to see if the chicken is done often. Wente Vineyards Reliz Creek Pinot Noir is a California wine with beautiful aromas and flavours of cherry, strawberry and vanilla with bright, natural acidity and delicate tannins. It has a long-lasting fruity finish. A perfect pairing for Chef Tammy’s chicken. The wine is named after the creek that runs through the estate vineyards. The retail price is $27.00 and it’s available at Lindo’s and Gosling’s stores. Quickly sautéed and then finished in the oven, these snapper fillet take only minutes to prepare and cook. Moist flaky fish, topped with sweet cherry tomato chutney makes a delicious, light meal for lunch or dinner. 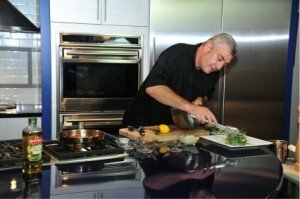 Chef Peter Jovetic prepares a plate with greens, snapper fillet and salsa. Gently saute onions for 5 minutes. Add tomatoes, vinegar, sugar, and chili sauce. Gently simmer until mixture thickens. Add the parsley and season with salt & pepper to taste. Season snapper with salt and pepper and gently sear in a pan. Place on a baking tray and bake for 8 minutes at 350°F. Serve on a platter or plate and spoon the chutney over the top of the fillets. Garnish with chives. 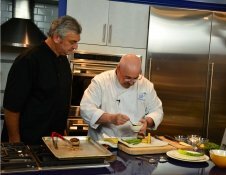 Jean-Luc Colombo Cape Bleue Rose is Gosling’s choice for Chef Peter’s snapper recipe. This French wine is a soft, delicate, salmon pink colour. The bouquet has subtle hints of peach, rose petals and soft pepper on the nose. It is dry, round and full of finesse. The wine is surprisingly complex, with intriguing notes of raspberries, cherries and fennel. The retail price is $18.50 and it’s available at Lindo’s and Gosling’s stores. A zesty lemon vinaigrette dresses this bright, healthy salad. 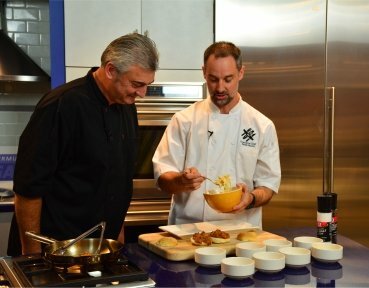 Host chef Peter Jovetic with Chef Chad from Red’s Steak House. In a small bowl, add all the ingredients for making the vinaigrette, except the oil, and whisk. Slowly add the oil and continue to whisk until the oil is completely incorporated. Season with salt and pepper. Place the watermelon and cucumber in a bowl and gently toss with the lemon vinaigrette. Lightly season with kosher salt and place on a serving dish. Garnish the salad with crumbled goat cheese, fresh strawberries, and blueberries. Finish by adding a torn fresh mint leaf on top and serve. Lunetta Prosecco produced by Cavit in Northern Italy is Gosling’s choice for Chef Chad’s watermelon and cucumber salad. It is pale straw in colour with greenish inflections, fine bubbles, and a creamy white foam. The wine is fragrant with aromas of apple and peach. It’s refreshing, dry and harmonious with crisp fruit flavours and a clean finish. The retail price is $17.25 and it’s available at Lindo’s and Gosling’s stores. The mild saltiness of creamy goat cheese is balanced by the sweetness of the beetroot and rich, intense flavour of blood oranges – a delightful salad that is ideal as a side dish or appetizer. Scrub beets and trim off ends, place in foil, season with lots of salt and pepper, wrap foil tightly around beets. Place in a 400°F preheated oven for about an hour. Once cooked, remove skin and allow to cool. Slice beets and goat’s cheese. Arrange on plate by layering one slice of beet followed by one slice of goat’s cheese. Mix orange segments with arugula leaves and season with olive oil, salt and pepper. Place on top of beets and goat’s cheese. 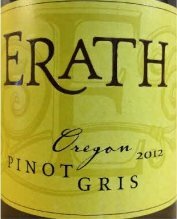 Erath Pinot Gris is from Oregon. It it intensely aromatic and yields sprightly wafts of banana, rose petals, and talc. The juicy palate of ripe honeydew melon, citrus and exotic lychee melds into a rich, plush crescendo, leaving the mouth with a pleasant tingle. A perfect pairing for Chef Ian’s recipe. The retail price is $21.25 and it’s available at Lindo’s and Gosling’s stores. Tangy, Sweet Chili and Lime Chicken Skewers with Pineapple & Chourizo Sausage make for a delicious light summer meal. Soak the skewers in warm water to prevent them from burning on the grill. Heat a cast iron grill on the stove top. Season the chicken cubes with salt, pepper, garlic, lime juice and zest, Cajun seasoning, chipotle seasoning and smoked paprika. 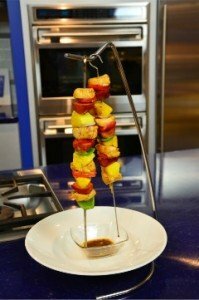 Arrange skewers alternating chicken, pineapple, red pepper, red onion and chourizo. Sear skewers on the grill 30 seconds on each side and then place in a pre-heated 350°F oven for 5-7 minutes. Glaze with sweet chili sauce after 5 minutes. Remove and let rest for 2 minutes. Garnish with cilantro leaves and lime wedges. 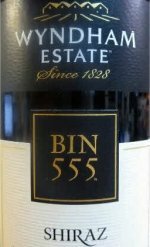 Wyndham Estates Bin 555 Shiraz is one of Australia’s famous wines. It is deep crimson red with purple hues. The bouquet has tones of spicy plum, black pepper and cloves. On the palate, the wine has generous plum and dark cherry spicy notes. It has a richness with a balance and flour to enhance the tasting experience. This wine is a perfect pairing with Chef Daamian’s chicken recipe. The retail price is $16.75 and it’s available at Lindo’s and Gosling’s stores. Chef Norma dishes up one of Bermuda’s most beloved dishes – Fish and Peas ‘n Rice! In a bowl, blend flour and rub until fine. In a separate bowl, combine 1/2 fresh lime juice and 2-3 shakes of Outerbridge’s Wine and Vinegar Pepper Sauce. Coat both sides of fish fillets with mixture. Let sit for 10 minutes. Pat fillets with paper towel to dry, dip both sides of fillets in the flour mixture. Shake off excess. Place butter and extra virgin olive oil in pan. Bring to medium-high heat. Pan fry both sides of fillets until golden brown. Juicy, tender lamb tournedos, wrapped in bacon and filled with a goat cheese, chive and thyme mixture. In a bowl, mix cheese, egg yolk, chives and thyme. Season with salt and pepper to taste. From the top of each tournedos, make a cross with a paring knife to produce a cavity. 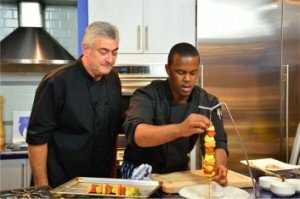 Fill the cavity with the goat cheese mixture, wrap the tournedos with a slice of bacon, using a toothpick at the end to keep it together. In a non-stick pan add oil and pan sear the lamb on the goat cheese side first for 90 seconds. Turn the lamb over and cook for 1 minute. Place in a moderately hot oven for 4 minutes. Serve with a red wine sauce. Wyndham Estates Bin 555 Shiraz is one of Australia’s famous wines. It is deep crimson red with purple hues. The bouquet has tones of spicy plum, black pepper and cloves. On the palate, the wine has generous plum and dark cherry notes. It has a richness with a balance and flavour to enhance the tasting experience. This wine is the perfect pairing with Chef Serge’s lamb. 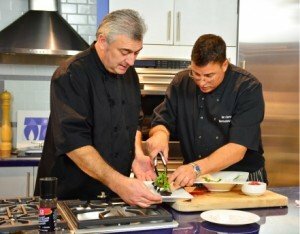 Private Chef Tammy Jones shares her recipe for delicious blackened snapper fillets topped with a salsa made from fresh seasonal melons, strawberries, pineapple and cilantro. Chefs Peter Jovetic and Tammy Jones preparing blackened snapper. Lightly coat snapper fillets with the blackened seasoning and then place fillets in a large pan over medium heat. Turn fillets after 5 to 7 minutes. Do not worry if the fish has blackened spots on it, the fish is not burnt… it’s just why they call the seasoning blackened! Once turned, place pan in a 300°F preheated oven for 5 minutes to cook through. Packed with beneficial antioxidant rich fruits, Chef Daamian’s Caribbean Fruit Salad is light, naturally sweet, and good for you too! Melt-in-your-mouth pork, topped with tangy coleslaw – it’s a favourite and classic slider! Season pork and then wrap in oven-safe plastic and foil (double the foil) cook at 300°F for 4 hours. Wait 30 minutes after removing from oven and then pull apart with fork or hands. Mix mayo, mustard, vinegar, sugar and hot sauce together. Add cabbage and carrots and mix together well. 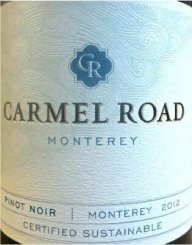 The 2012 Monterey Pinot Noir is French oak aged briefly to add earthy, dark toast undertones to this brightly fragrant, berry spiced wine. The balance of the final wine is fantastic as it comes together in a velvety finish. The wine is a perfect match for Chef Derek’s pork recipe. The retail price is $25.50 and it’s available at Lindo’s and Gosling’s stores.